Looking for a few new players. Our latest statistics can be found in the banner. We are an active UK based guild looking for two daily and HSTR ready teamplayers. We are invite only. Contact me on Discord if you want to know more about our guild, guildrules or any other question. Are you in a guild that's too demanding on your time? Or a formally strong guild that's lost its way? Are you just looking for somewhere competitive that will let you play the game your way? The Last Days of Sun are looking for committed players to make us stronger, but we appreciate this is only a game and everyone has other stuff going on in their lives. We don't require specific toons, or have strict targets that have to be met. If you're an active player who wants to be in a strong guild and work towards HSith, then we want you. Currently at 100mil+ GP with 48/50 players. Formed last year from a merger of two guilds, so we have a very strong core of 2mil+ GP players, and have recently merged another small guild into our ranks to refresh our membership. Now looking for some extra players to fill our roster and help us push onto the next level. The Dread Masters are a fully heroic, organized, and social guild with 135m GP that is focused on Territory Wars and Grand Arena. Currently, we have a 47-15 record in TW, get 41* in Dark Side TB and 40* in Light. Pit is simmed and the other two have join periods then are FFA; HSTR runs at 3pm EST, HAAT at 8p, and hPit at 10. Guild reset is 7:30 EST. We are currently seeking recruits with deep, well developed rosters capable of immediate contribution across all guild activities. Hpit and HAAT 2-3x / week. We are a pretty relaxed group whose been together for about 3 years. We are currently working toward HSTR. We ask that everyone participate in the guild events by joining TW, deploying every round of TB, and contributing to the sith raid. Would love folks with HSTR-ready squads, but all GP welcomed as long as you contribute frequently! We are very active on the game chat but don't use discord. Aktuell sucht derzeit Star Forge Endor (PvP-Wing) 2 neue Member mit ca 3,5 Mio GM, die TW orientiert spielen, die dafür nötigen Teams (BH, FO, Traya, CLS, JTR und NS) besitzen und bereit sind, nach Empfehlung zu farmen und zu modden. 600 Tix/d sollten eine Selbstverständlichkeit sein, Discord und swgoh.gg-Profil sind Pflicht. Star Forge Alderaan sucht einen neuen Mitspieler mit PvE-Fokus, aber auch Interesse am TW ab 3,5 Mio GM. Die nötigen Chars für TB und TW sollten vorhanden sein. 600 Tix/d Discord und swgoh.gg Profil sind Pflicht. Ebenfalls sucht unser Nachwuchswing Star Forge Yavin zwei Spieler, die sich mit uns in naher Zukunft am HSR versuchen wollen. Voraussetzung 1,5 Mio GM, Gern auch stärkere Spieler, die etwas stressfreier spielen möchten. min 400 Tix/d und swgoh.gg Profil und Discord-Pflicht. Auch unser Casual-Wing Star Forge Takodana sucht noch Spieler, die entspannt spielen wollen oder gerade erst mit dem Spiel starten. Star Forge bietet allen Spielern Unterstützung durch vielfältige Angebote auf unserem Discord-Server. Falls du dich für eine Aufnahme in eine unserer 12 Gilden interessierst, besuche uns auf unserem Server https://discord.gg/dfcyvw8 oder schreibe mich auf Discord an DonasJade#1304. HPIT, HAAT, T6 Sith !!! 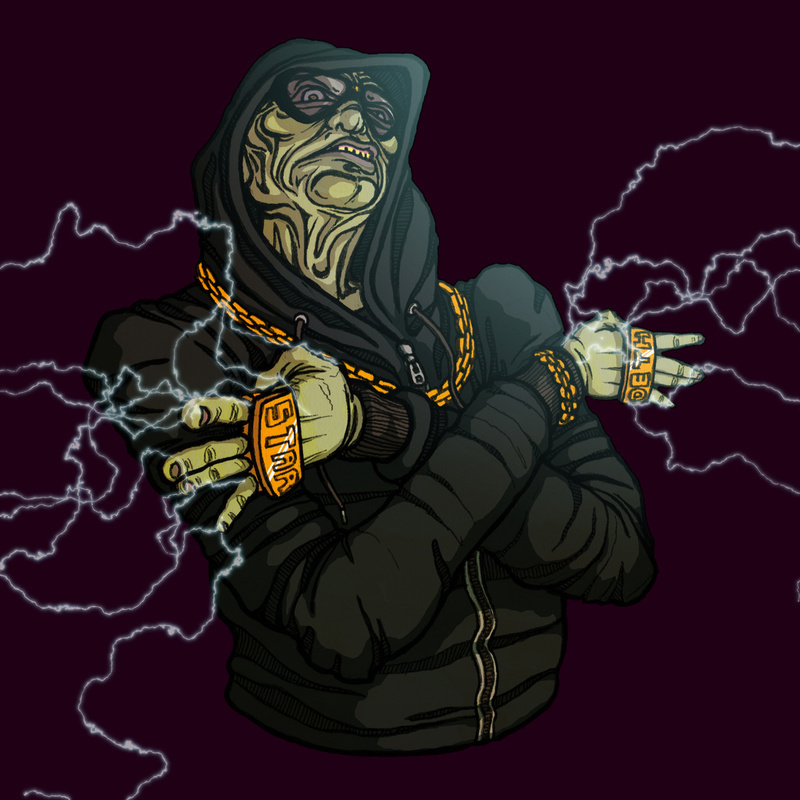 Struggle is recruiting active, friendly players and a minimum 3.8m Galactic Power (negotiable). Recently changed our recruitment guidelines in order to progress. We will consider those under 1.5 mil if they have a strong JTR team. Currently have 2 open spots. We have Heroic Rancor, Heroic AAT, and Heroic Sith Triumvirate on routine farm status; our Sith rules ensure everyone has a fair chance for the top 20 gear rewards. 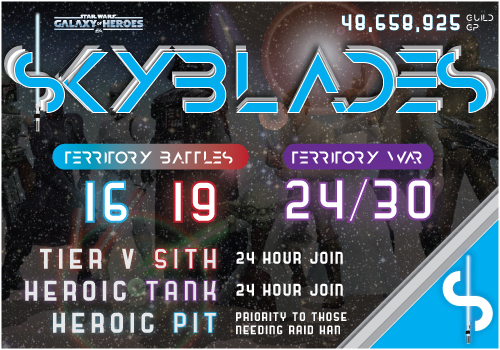 Territory Battles is our current focus; we’re 44/45 in Light Side and 46/48 in Dark Side battles with the ultimate goal of accomplishing 100% in both modes. As such, new recruits should be prioritizing appropriate TB teams and inflating their Galactic Power as high as possible (starring, leveling, gearing, and modding one’s entire roster). We’re currently asking new recruits to have a minumum of 3,500,000 GP prior to joining, but exceptions can be made for exceptional players. Newly started guild «Executrix Janitor Squad» is looking for members! We are the core from an guild that became unactive and the core wanted to progress further to reach our goals! *Max stars on both light and darkside in TB. *To win every TW battle! *A good and healthy social society. *Have fun and enjoy the game together. The guild is under a week old and we are lacking the last 18 players to fill our ranks to get maximum out of tw/tb, ticket gains and in the end farm HSTR. But for that to happen we need you! *TW win ratio is around 60%. *TB we have around 20-25 stars on both lightside and darkside. But we need more ppl and GP to progress furter! Thats why we need YOU! *Lvl 85 and around 1million GP. *To be able to follow instrctions in TW/TB. *Be nice towards your guild mates and have fun playing the game. *If you are going to be away and not able to play for some days. Give officers a message. Hope you will join our ranks! ‘That Takes Effort’ is recruiting (158m GP 46/50)! All heroic raids on farm!! Raids at 9pm EST. Must communicate in in-game chat (within 24hrs to avoid an auto kick) at least and strive to achieve your 600 daily coins (nobody's perfect and sometimes real life gets in the way). Minimum 2.5mil GP, Prioritizing rosters with JTR and strong synergy teams for HSTR, TW and TBs. We have a guild Slack channel where we discuss all things SWGOH. Communication and a desire tuo improve are a must! We can solo all but the HSTR. We are Echo Base Squadron, a fully Herioc guild. We are an active UK based guild looking for daily and HSTR ready teamplayer to fill our roster. We are a proud part of the Thrawn’s Dark Lord Raid Rekkers Alliance. Fully heroic Guild looking to fill our ranks. If you have HSR squads ready, can provide 500+ tickets per day, and are very active in all Guild events....We want you! ~ Communication - oh wait...yeah I did mean to say that twice. After much discussion, we have decided to offer up two guild spaces to relative beginners. Your only requirements are to maximise your daily raid tickets, join our Discord server for strategy and chat, turn up for TB and TW. And that's it. You would do well to hit all the raids to maximise the benefit of being in the guild, but that's up to you; you won't get hassle if you miss raids. You WILL get hassle if you miss TB and TW, even if you can't contribute much. It's the effort that counts, not the result. We want you to be part of the group and grow with us so, when it comes time for me to retire, you'll be there to take over. From us, you will get guaranteed heroic raid completion with the associated shards and gear; 40+ stars in both TBs; a competitive but fun atmosphere for TW; and as much gear and advice as you can handle. We are UK based, but our members are international. From California to Mauritius, from Norway to Australia, we're everywhere. HSTR launches at 12pm UK time, the older raids launch between 7pm and 11pm. Pit and HAAT are over in minutes, so be quick if you want to contribute. HSTR takes around 11 to 12 hours still, so plenty of time to get on the scoreboard. The are no restrictions on hitting any of the raids after the join period ends. Go nuts. Guild resets are 6:30pm GMT. If that's of interest, contact me on Discord: RabbieBurns#4045. We’re looking for good, solid, active players, level 85, minimum 1.8 mil GP or above. It is not my fault is an EST guild looking for a group of about 20 to join us. Mix of levels is ok. Individuals welcome. We run HPIT, HAAT, Sith T5/6. We usually hold our own in Territory War. Pictured below was done with only 25 players. Legends of Old is a very social, totally independent, and growing guild that takes progression very seriously. We are currently looking for dedicated players with developed rosters capable of contributing to territory battles, and all heroic raids. We have in our guild several over 2m GP. Here at Legends of Old we seek to find the balance between casual and serious gaming. We expect all of our members to play daily in all guild activities, but realize that SWGOH is just a game and that Real Life takes priority. We have no strict ticket requirements, will never tell our members which characters to grind or play(although we do give recommendations to brand new players), we give gear very freely and are free from any alliances. We are currently not in Territory Wars, however, with more people we can be sure to do some damage. Our last Dark Side Territory Battle we achieved 12*, and 12* on Light. 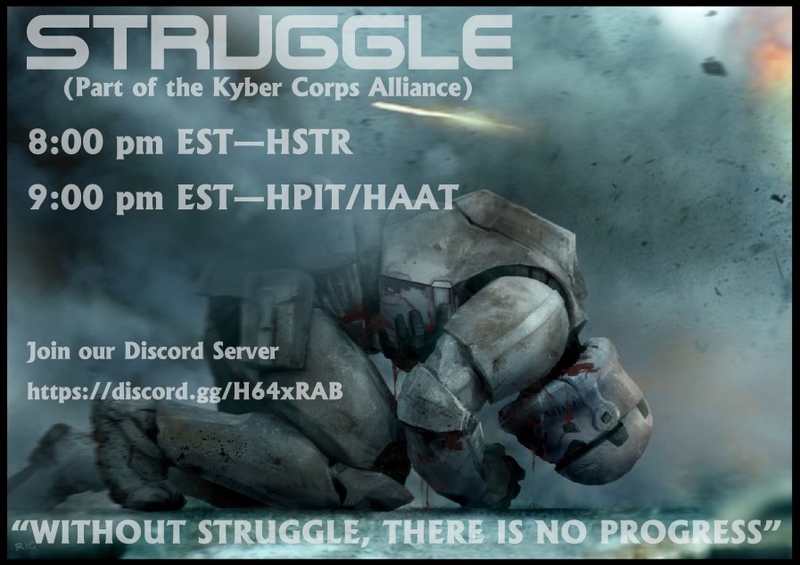 We run SRT, AAT and Heroic Rancor raids all starting at 10:00 PM Central time. We do not have a discord chat and don't require it, we do have a active in game chat. We track player contributions to make sure all our members are pulling their weight and advancing in power as the guild grows. Leave your current stagnant guild for greener pastures, or take a step down from your stressful and intense Elite guild while still earning fantastic rewards. Contact me with your swgoh.gg profile via the forms or drop me a message here. Thank you and may the force be with all of you. HSTR on farm as we speak! We are a 120m gp guild looking for some more HSTR ready members. We are a fun group of active players that play because we enjoy the game, and don't feel the need to require hard activity. We understand life comes first, and as long as you're communicating on discord and respectful of others, you won't get kicked for a missed day or a vacation/ holiday. We have HSTR on farm and are now looking to increase our numbers. After much discussion, we gave decided to make two spaces available to newer players. We are a fully heroic 144m GP guild, getting 40+ stars on both TBs, and competitive in GW. We're have a couple of spaces available after removing some players who were not contributing, and I'd like to offer them to players looking for a leg up in the game. I'm after players at level 80 or above, who will give 600 tickets daily, sign up to our Discord server, and will turn up for TB and TW. For TB and TW, it doesn't matter how much you can contribute, making the effort is what counts. In return, I can offer all-heroic raids, a low drama but committed guild, and as much advice and guidance as you need to grow your roster. We don't take ourselves too seriously, but we know how to play the game. We're are UK based, but our members are worldwide, so you'll always find someone online to talk to. Guild resets are 6:30pm GMT. Raids are free-for-all after the join period ends; the older raids launch between 7pm and 11pm GMT (on rotation), HSTR launches at noon. Pit and HAAT are over in minutes, HSTR is available for approximately 11 hours (getting shorter each time). Add me on Discord for a chat if you want to join: RabbieBurns#4045. Just Sithed Myself - needs 2 new members! We are 91 million gp, dedicated casual (Somewhere between active and casual), no ticket requirements, TB participation expected (it lasts 6 days people) 30/31* LS/DS, TW we are 27 out of 28 victories! We are planning our second attempt at hSTR, so someone who is working on P1/P2 teams are appreciated. We focus on enjoyment and firmly believe life comes first! Time away is allowed with notice, but the dedication of our group may be addictive. We use discord for organizing and socializing. PM me for invite or look us up in game. 7:30 pm CST raid start times, 24 hr join period, live for 30 minutes before solos post in hPit/hAAT. Come one, come all, and bring a fresh change of pants! Welcome to A KYO Menance. We're looking to fill 10-12 spots in our guild. We left our old HSTR farm guild and recently merged with another new guild. We've got a 100% winning TW record (1 - 0). 37 people 71 mm GP. 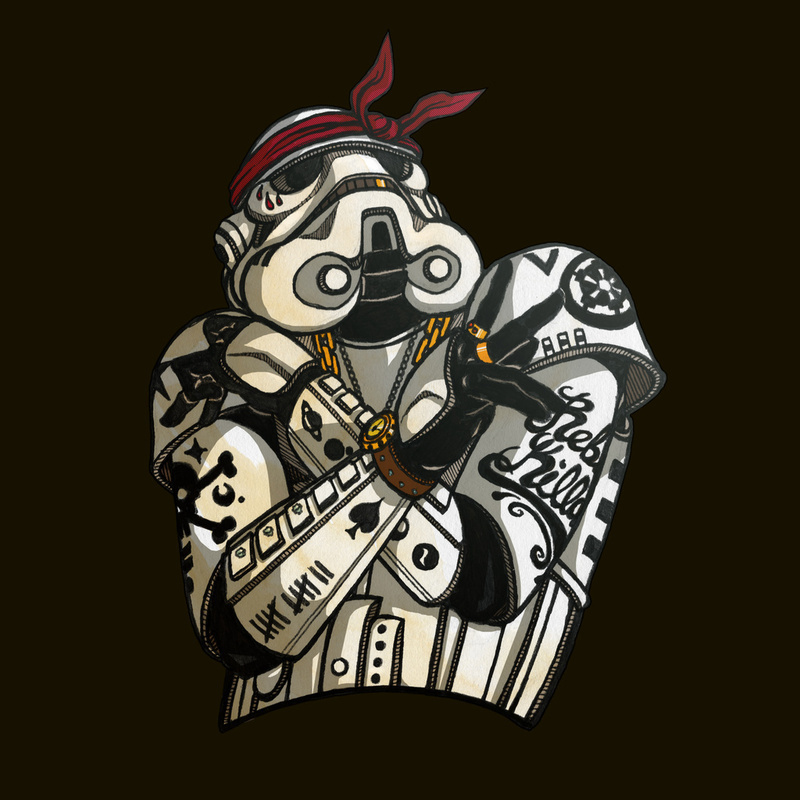 We’re looking for daily active players with at least one HSTR squad ready to contribute. We’re an adult guild committed to helping each other out. We’ve got some long time players that can offer as much advice and guidance as you want to grow your roster. We get that life happens so just communicate and it’ll all work out. Guidelines are below. Let me know if you're interested. My ally code: 318-667-362 or msg me on the forums. Happy hunting. 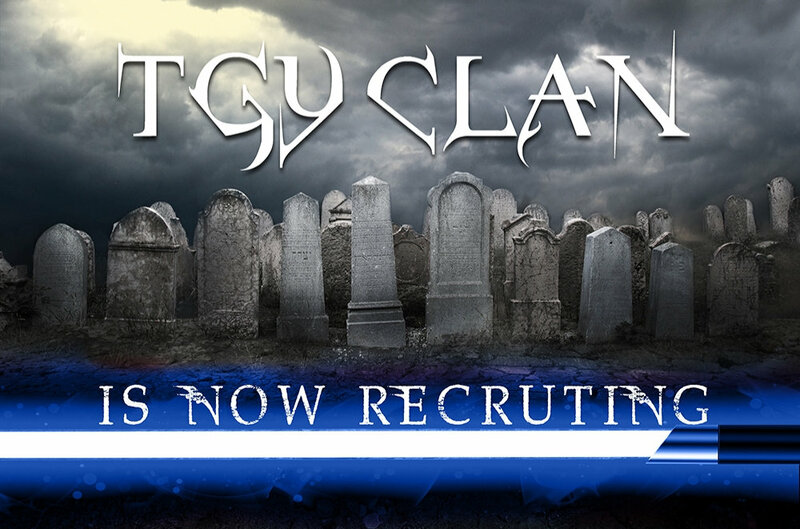 TGY CLAN (The GraveYard Clan) is a 173+M GP UK/Euro- friendly guild on regular HSTR farm , and looking to fill 1 spot. - Good winning record in TW. - All raids have 24hrs join period and open damage at guild refresh time: 6:30pm GMT. Drama Free Guild; we treat our players like adults who are dedicated and passionate about the game, participate regularly in all guild events, yet have lives outside swgoh. Ideally we are looking for an active player from the UK/Europe zone, or around. Though we have several players from the US, so if our guild timings are convenient for you, then you are welcome to join. Applicants must be > 3.5 M+ GP minimun (exceptions can be made for lower GP on individual basis and depending on roster quality) and willing to work with us in our new guild focus of building tougher TW squads. Overall Quality of mods is a top priority to be eligible for recruitment. Discord is highly recommended especially for new joiners to get up to speed with guild focuses and requirements. Our discord has a lively community, Experts in all fields of the game ready to share advice with others, handy bots to make life easier, and lots of friendly banter. If TGY CLAN is what you are looking for, then please send me a direct message here, with your swgoh profile link and discord name. And you are free to join our recruitment server : https://discord.gg/WnVVXJv to talk to our recruitment officers and get more info. **Gaming Geeks** is a looking for 5 more active members to join us, or merge with our clan. We recently merged with another guild, and have 5 slots still open. We regularly do Heroic Pit, and 5th tier Sith and Heroic Tank.